TenrikNiels: -Do you have the collar already girl ? TalinaofGor: -she looks down at the girl as she says- Tal girl. TenrikNiels: are you still in the other room moon ? phoenyxblissSchendi: May thisone have an ehn ? TenrikNiels: Tonight is a important night for you moon. TenrikNiels: Tonight you will be collared to the city..
TenrikNiels: Owned, property of the Ubara and Ubar. TenrikNiels: As per order of Ubar and Ubara of The Oasis Of Two Scimitars I will place the collar of the city upon your slave throat. TenrikNiels: This collar... ~Reaches into the pouch and removes the golden collar of the Oasis~ has four purposes. TenrikNiels: 1. It will visibly designate you as a slave. TenrikNiels: 2. It will impress the city and your master/Mistress' slavery upon you. TenrikNiels: 4. and finally, I will make you easier to leash. 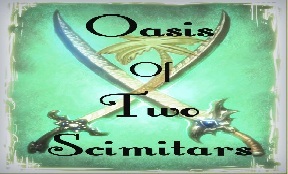 TenrikNiels: I magikalmoon hereby submit myself, totally, completely in all things to the city know as Oasis Of Two Scimitars"
TenrikNiels: "A city girl, a city slave. An article of property, the city's to do with as it pleases"
TenrikNiels: ...your name (for right now) is moon." TenrikNiels: Tonight girl you have begun your journey to become one of the best Kajira in all of Gor..
TenrikNiels: Who are you girl ? TenrikNiels: What are you girl ? TenrikNiels: what is your name girl ? TenrikNiels: Welcome Kajira, to the Oasis. phoenyxblissSchendi: May this one return ? TenrikNiels: will you post the collaring of moon in the forums. Congratulation and welcome girl.. Well done. congratulations on your collaring sister.